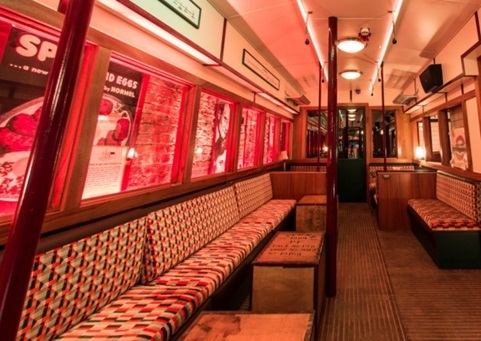 London, and its famous landmarks, endured World War II just like the rest of Europe did. 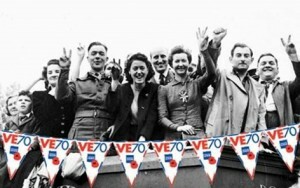 As seen in A Royal Night Out, everyone celebrated VE Day throughout the town. Here, we take a look at how the war affected these landmarks. Buckingham Palace became a target that was hit on sixteen different occasions. King George VI and Queen Elizabeth publicly stated that they would stay in the Palace and did throughout the bombings. The Queen said to Londoners, “I am glad we have been bombed. It makes me feel I can look the East End in the face.” Buckingham Palace, first hit on 8th September 1940, came to the ground. The second hit was the following day and left a crater in the swimming pool, damage to the North Wing and smashed the Palace windows. It was also hit on the 13th and 17th September, 1st November and 8th March 1941. In June 1944, a V1 bomb destroyed the Palace’s grounds, walls and summer house. Despite all the hits the Palace took, the structure remained standing. Selfridges on Oxford Street hit a number of times. In 1940, the bombs damaged the roof gardens and shattered a signature window that celebrity visitors often autographed. The following year, another bomb set fire to the Palm Court restaurant. In 1944, Selfridges’ Christmas tree displays were scattered throughout Oxford Street. Now over a thousand years old, Westminster Abbey has been host to coronations, weddings and resting places. It was also a targeted landmark in World War II. When the war broke out in 1939, the Abbey moved important artefacts like the Coronation Chair and Coronation Stone to safer locations. 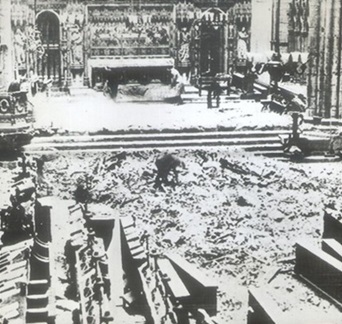 Westminster Abbey was hit four times – September 1940, twice in October 1940, twice in December 1940 and once in March 1941, with damage to the walls, windows, roofs, yards and chapels. The Big Crisis happened during the Blitz on 11th May 1941. The Lantern roof over the North Transept crashed and hit the roof above the Tomb of the Unknown Warrior, a tribute to the soldiers in the First World War. During this chaos Prime Minister Winston Churchill said, “The Abbey must be saved at all cost.” Westminster Abbey was saved but did suffer damage from a fire that affected the Deanery, parts of the Abbey roof, and the Cheyneygates (two rooms placed over the entrance to the Abbey cloisters). 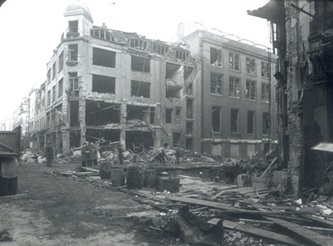 Buildings from the Little Cloister to the Dean’s Yard were also destroyed. Trafalgar Square was named after the Battle of Trafalgar where the Royal Navy was victorious in the Napoleonic War of 1805. 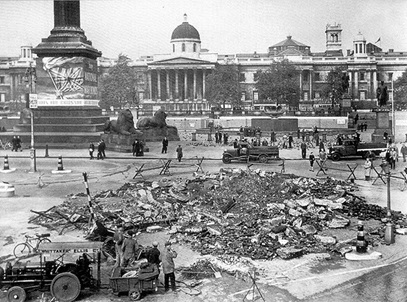 135 years later, Trafalgar Square faced its own battle during World War II. 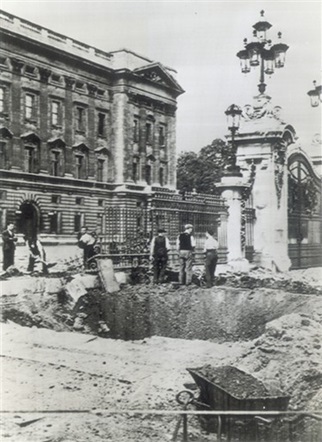 At the Square’s northern wall, an air raid shelter for 800 people was built in preparation of an air attack, and the Trafalgar Square Underground Station was estimated to shelter a further 1,600 civilians. However, on the 12th of October in 1940, a 500 pound bomb fell on the southern end of the Square that detonated above the Underground Station’s ticket hall. The collapse caused debris and earth to bury those finding shelter there. A rescue mission was completed but there were forty causalities. Despite all of these attacks, the people of London never lost their sense of community and fighting spirit. Due to being in the Capital, Londoners were always the first people to hear breaking news. They were determined to fight against what was happening and not surrender, and as a result took their safety into their own hands and broke into closed off underground stations in order to seek shelter. Even though many landmarks were bombed, this did not stop them from becoming the centre pieces for VE day celebrations, in which places such as Piccadilly Circus and Trafalgar Square were used for the jubilations. As portrayed in A Royal Night Out and in the Queen’s diary, the princesses and their cousin Margaret Rhodes rejoiced with Londoners in the Square. A bar called Cahoots opened in Soho on March 5th of this year, which is based on the underground stations that were transformed into air rade shelters during the Blitz. The Imperial War Museum is highlighting the fashion of this era in a new exhibit called ‘Fashion on the Ration: 1940s Street Style’ and will be running from 5 March to 31 August 2015. This collection features air raid shelter apparel, recycled aeroplane parts turned into jewellery, to military uniforms to functional fashion. The IWM wants visitors to “share your Second World War family photos” with them through social media with the hashtag #WhatMyFamilyWore. A Royal Night Out is released in the UK on 15th May 2015.